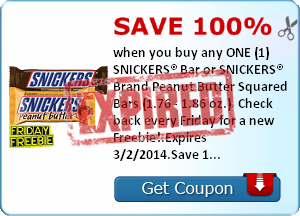 Save 100% when you buy any ONE (1) SNICKERS® Bar or SNICKERS® Brand Peanut Butter Squared Bars (1.76 - 1.86 oz.). Check back every Friday for a new Freebie!.Expires 3/2/2014.Save 100%. Save $5.00 when you spend $15.00 on any Henkel® Personal Care Products including Dial®, Dial® for Kids, Dial® for Men, Tone® and Right Guard® Body Wash..Expires 4/23/2014.Save $5.00. Save $1.00 when you buy ONE (1) Truvia® Baking Blend with sugar..Expires 4/9/2014.Save $1.00.